MOTHERS DAY SPECIAL OFFER: FREE UPGRADE FROM OUR STANDARD TO DELUXE BOUQUET! 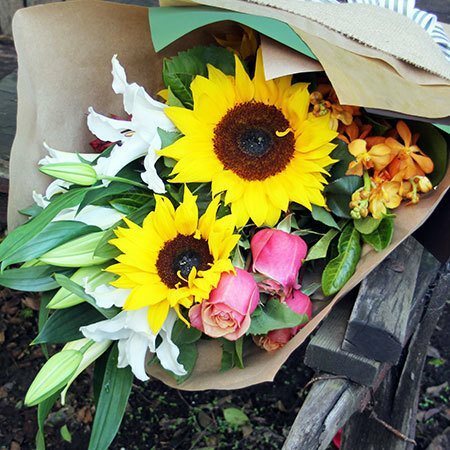 Send mum a slice of the South of France mixed with a touch of the South Pacific with this `Autumn-esque` bouquet of rustic sunflowers, fresh peachy roses, lush orchids & lilies. Bright yellow sunflowers add a touch of country, while the stems of exotic perfumed white Oriental lilies, long lasting juicy orange orchids, and sunset coloured roses bring an essence of the tropics into the mix. Order these flowers online for Mothers Day, call us on 1800 66 66 46 or email directly to sales@flowersforeveryone.com.au (make sure to mention this special offer if ordering via phone or email). *Please note: The pictured bouquet upgrade offer is specific to Sydney metro only deliveries.